After being so health-conscious and good yesterday, I felt that I could now go to the dark side. Oh yes ... dark ... dark chocolate. 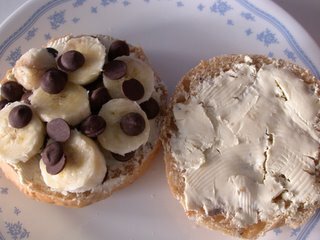 I'd been craving dark chocolate (like that's unusual ...) and I still had the little drops of semi-bittersweet chocolate in my pantry as well as two bananas so ripe they were on the verge of self-mushilation. 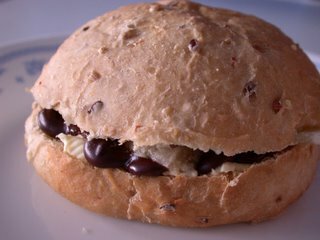 I also had those walnut buns from Cheese Sammich Day and I am desperate to use these up before they started going stale. The humidity in Singapore makes everything go off so much faster than normal. So, since yesterday was saintly restraint day, today had to be sinful indulgence. Blurry-eyed and slow from sleep, I started putting together a sweet treat for myself. 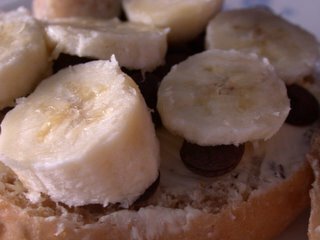 The sandwich was scrumptious but I think the next time I make this, I will trickle a stream of amber honey over the banana layer as I think it could do with a bit more sweetness. 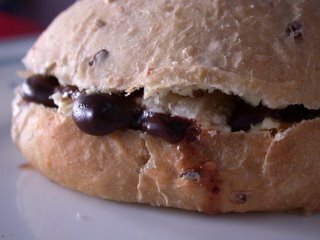 The dark chocolate was fabulous though and I was licking my fingers as it oozed out from between its golden banana and cheese captors. I seldom eat breakfast but a sinful breakfast like this is worth repeating. A deserved 8.5/10 for taste to this sweet start to the day but an admonishing 6/10 for being naughtily unhealthy. 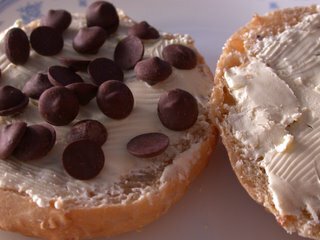 Oh my, chocolate AND cream cheese? My stomach literally growled. You sure know how to make a late night snack. All your reasons for making this fabulous confection were perfectly valid! You did the right thing. Deliciously sinful - can't go past chocolate and bananas. 1.) Stop making me laugh out loud. 2.) That sandwich looks, ummm... well, suffice it to say that it's amazing that I didn't hit the 'back' button. P.S. found you because of the cheese sandwich controversy. Erin - WEG, yes I do ... I always know the most evil ways to pig out. LOL. Sher - Yes, yes, I am the Queen of Rationalising! G'wan, make one ... you know ya wanna. Haalo - Aww, thanks so much for your kidn comment. It's such a honour. I love your site and your recipes are really inspiring. Ejm - Welcome! I so agree. 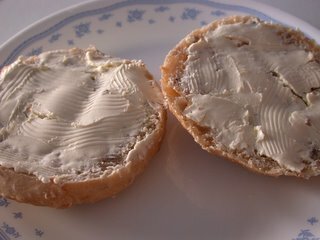 I found your site through the Cheese Sammich Revolt too. I really like your site and reading about all your experimentations. I am going to try to make my own pita one day. I'd glad you had a chuckle here. And congratulations! You are the first person who noticed the banana giving a cheeky raspberry. When I reviewed the pictures, I just could not resist! LOL. Tin - You are so welcomed. I am a strong believer in eating what makes you happy. So have it for a snack for sure! Do make the pita! They're dead easy. Do let me know how they turn out. But next time I make them, we're going to try making them on the stove top the same way that we make chapatis. We think we'll have more control that way. The oven temperature is so uneven that we don't get the full puff-up that we're looking for on the pitas on one side of the bread stone. Stop! Stop! You're killing me! Sounds like my kind of breakfast. 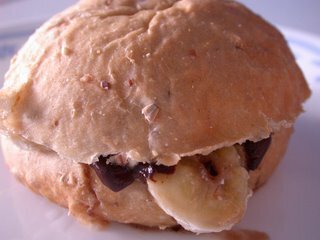 We eat grilled pb and marshmellow sandwiches (sometimes with bananas) all of the time..sometimes I even do it with nutella instead when I want to be extra sinful. Your sandwich fits right in! Elizabeth - would cooking the pita over the stove make it more like a chapati? I did not stage the banana raspberry per say. The banana slipped out from its cheesy strangehold and when I saw it in my viewfinder, I just thought ... "Ye cheeky bugger giving me the raspberry!" and took the shot. Kady - PB AND marshmallows? Sorry but ... eeuuwww! Actually, I know this is awfully uncouth of me but I never really liked Nutella. Even as a child. My family thought I was very strange indeed.